So why is the dollar bill presented below with the All-Seeing Eye having a thunderbolt for a pupil, surrounded by a spiral for an iris, when real eyes are not like that)? Images by Warren Neun Light have disappeared. The idea of depicting the All-Seeing eye/captstone of the pyramid with flashes of light in the center of a spiral is consistent with the philosophy of those who put the pyramid with its all-seeing capstone on the bill in the first place. In this perspective, a thunderbolt in the eye would naturally refer to the illumination of Zeus, or carrying it further back would refer to the illumination (with the “knowledge of good and evil”) of Adam in the garden. The spiral seems to have appeared to the ancients at moments, considered sacred to some and terrifying to others, when a portal opened between normal earthly dimensions and some other dimension; and a power associated with flashes of light beamed through. This power was able to guide and exert control over the affairs of men. So it was a political power; but it had its root in the presence of an intelligence from another dimension that was exerting a mental/spiritual influence over the hearts and minds of men. That is why, when a person in modern society considers the image of an eye shining from its center with a lightning bolt, and emanating out from that having a spiral aspect, the immediate reference that comes to mind is hypnotism. Or to some it will bring to mind the “evil eye” of folk tradition. These are current expressions of the thunderbolt of Zeus – the illuminating light obtained by Adam from the Serpent – in Zeus being carried forward into the age of classical Greece. The myth of Zeus (the Roman Iu-Pater/Jupiter and also called Iapetos by the Greeks) was the societal memory in classical times of this same power. It was the memory of Japheth, son of Noah (Bill Cooper, in After the Flood), who had played a lead role in picking up the illuminated tradition of Adam from before the flood and establishing its power in the post-flood world. One of the spirals pictured in the above video (well apparently it’s gone now) seems to have a flame emanating from it in a similar fashion to the Norway spiral. Also noteworthy in the video were several stone age depictions of humanoid figures either holding spirals or with spirals associated. I found some images, though. See below. Some of these beings look very tall. It seems likely that stone age peoples venerated or feared what might be called Lords of the Spiral. According Spiral Dynamics: The Conch & the Earth’s Rotation, the Hindu god Vishnu — the Lord of the Cosmos — is commonly depicted with a spiraling conch in one of his hands.The spiral was a prominent feature of the passage tomb at Newgrange, or Brú na Bóinne (palace of the Boyne), in Ireland. Also see St. John the Divine Cathedral Occultic Symbology, and notice the pillar with the spiral and the beast being born out of the earth. So why, on the dollar bill, is the eye depicted atop a pyramid? 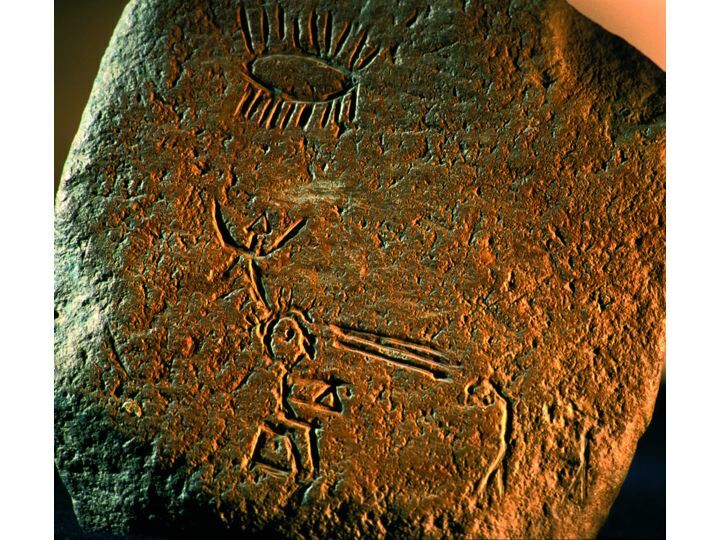 The reason is that the “Christmas tree” held by the power figures in the petroglyphs above is actually a hand-held pyramid. Inspecting the petroglyph below you can clearly see a seated figure using a hand-held pyramidal object to project a mental/spiritual power that is causing another figure to bow before him or to carry gifts to him. This ruling figure seems to have a form of head-gear that draws power from a sun-like object above him by means of some kind of antenna. If the above petroglyphs refer to this technology, then they depict a power-figure projecting a hypnotic spiral effect throught the use of a hand-held pyramid and helmet-mounted antennae. 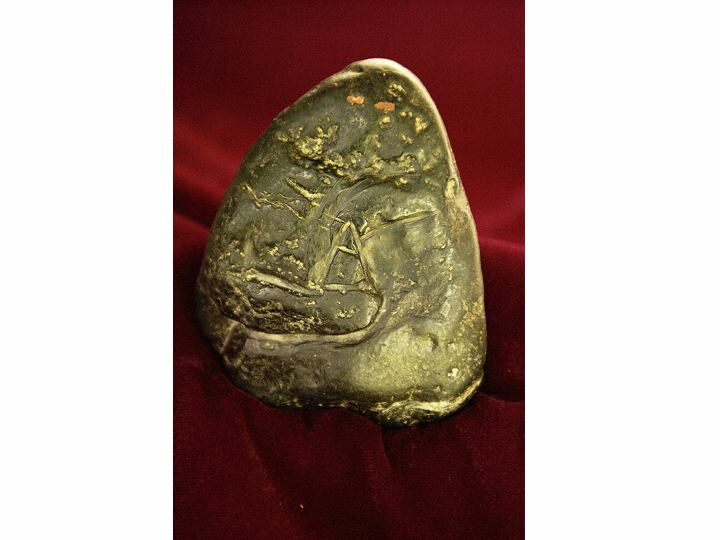 Here is another hand-held pyramidal object that seems depict the seated power-figure holding a pyramid as a pyramidal-shaped object itself! We are seeing a frontal view. Notice the two hypnotically glowing eyes and the pyramid held against the chest. The 10” tall artifact pictured below was probably used in this way! 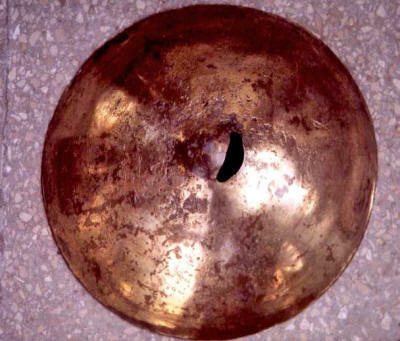 It was found in the 1980s in Ecuador. What? Wait a minute! A hand-held object featuring a hypnotic eye that was used in the most ancient of times to project a form of hypnotic power from “the gods” over the human population, this is what is depicted on the most common form of the money which projects the power of the most powerful nation in the world today?? Yep. And here is a helmet found together with this pyramid. So, reconciling these two objects to the petroglyph of the seated figure, we may be looking at a helmet, in which can be mounted an antenna, and a hand-held pyramid, designed to be used together by a technician adept in their use. Project Camelot and Project Avalon draw similar conclusions. 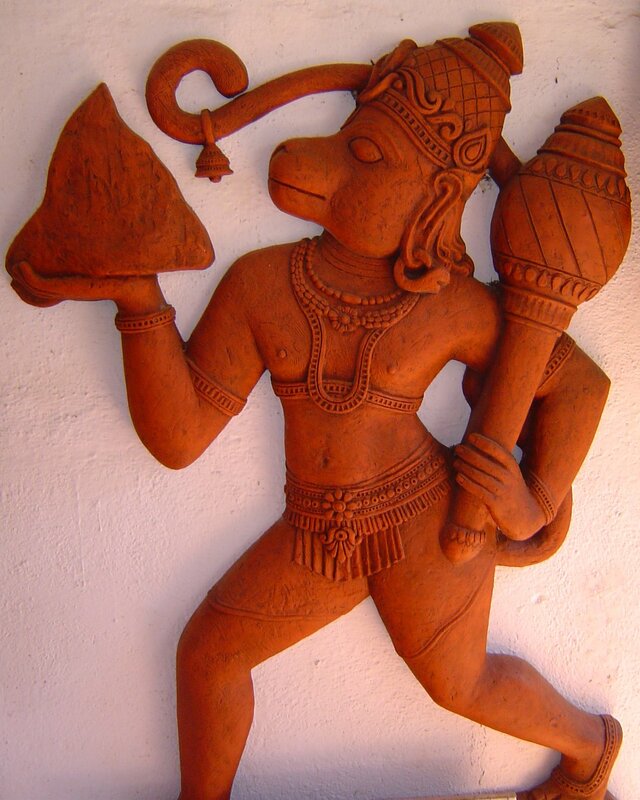 In further evidence of this tradition, below is an image of the east Asian monkey-god, Hanuman, with a hand-held pyramid. The god Hanuman shows up not only in the ancient Far East, but also maybe 1,000 years later in Central America! That should not be surprising since this tradition has been carried forward through the halls of power from the most ancient of times all the way to the present, as evidenced by the placement of its symbols on the currency of the currently most powerful nation on earth. It’s a lot to absorb. Who is the light-bringer? Lucifer! Join the conversation at Minds!